Sailing Vessel "Gone With The Wind"
This website was created as a celebration of our first sailboat. When we first started looking we thought maybe we could handle a boat as big as a 32' length. Then we started looking at different marinas from Newport Beach, CA as far south as Chula Vista, CA. We soon realized from seeing the different types of equipment and boat layouts, that the Hunter seemed to be just what the doctor ordered. The problem was that most good cabin layouts we in the larger boats. So we started looking at 38' to 42' ships. Although this seemed quit a bit larger then we though a novice sailor should start with, we went for it anyway! Hunter 376 The Hunter 376 won "Boat of the Year" in 1997 for "Best Value", a year after our ship was built. The follow comments were made by the judges after evaluating the 376, "These guys have really thought things out well." Clicking the title above will bring up the review page for Cruising World Publications. By clicking the above title you can see information about the Accommodations and Layout, The Galley, Electronics & Navigation Equipment, specifications on the Sails and Rigging, Deck and Hull, Engine and Mechanical Although there has been two previous families who have owned the boat, the decks and interior look almost new. Each owner has added and/or upgraded many areas of the boat. Routine maintenance required the boat to be hauled out and the hull was completely repainted, the refrig/freezer was completely replaced and the starter battery and motor were recently replaced. The roots of Hunter Marine actually began back in the 1800’s with a German immigrant by the name of Henry Luhrs.He became involved in the outfitting of trading ships and eventually owned a chandlery and then his own ship, The Sophia R. Luhrs.His grandson, another Henry, was also in love with the sea and continued the family heritage by building and repairing family cruisers and fishing boats on the New Jersey coast. Before long, Henry and his sons, John and Warren, were building over a thousand boats a year. In 1965, the company, Henry Luhrs Sea Skiffs, was sold to Bangor Punta, a large timber conglomerate. John and Warren went out on their own. In 1969 they bought a small New Jersey builder named Silverton Sea Skiffs and became very successful by following the same techniques their father had shown them. its way to become a major force in the sailboat industry. Warren became involved in ocean racing and set many records aboard Thursday’s Child and Hunter’s Child. These floating test beds became the basis for many of Hunter’s innovations including B & R rigs, arches and water-ballast. 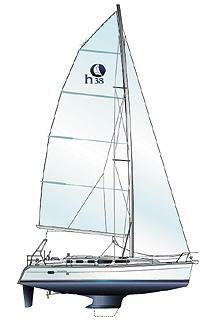 The New HC 50 is based on the success of Hunter’s Child, which provided veteran ocean racer, Steve Pettengill, the best ever finish for an American in the last BOC Around the World Race. Today, Hunter Marine Corporation is part of the Luhrs Marine Group. It includes Silverton Marine Corporation, builders of family inboard cruisers, Mainship Trawlers, and the Luhrs Corporation, known for sport fishing boats. All four of these companies share information, technology and buying power to bring you the best value on the water. 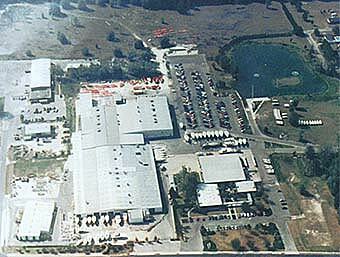 Hunter Marine currently produces 24 foot through 50 foot boats in the state of the art, Alachua, Florida plant and builds 9 through 21 foot Advanced Composite Process trailerables at it's Hunter Composite Technologies, Inc. division in East Lyme, CT. The Luhrs Marine Group has recently opened another facility in the United Kingdom, Luhrs Marine Limited, which builds Hunter mid-size sailboats for the European market. These innovative sailboats are now marketed in over 45 countries throughout the world. They are also certified by the NMMA and the Community of Europe and are in compliance with the ABYC. Hunter Marine is also one of the first companies to achieve Marine Industry Certification.